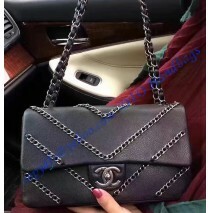 There is no a single word which can describe the all-new Chanel Chevron Chained Flap Bag. It is uniquely different, beautiful and much more. We believe that a single word can be used, but only to reveal a glimpse of the bag. It is a word princess. Princess bag is designed for a princess from all over the world. The strong pink color isn’t possible to see it, regardless of the day, time and location where you are. Expect plenty of comments and questions about the bag. 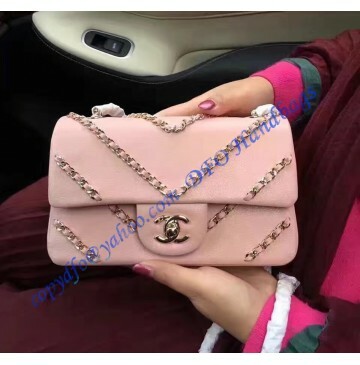 It isn’t possible to comment this bag, period. The stunner here isn’t made just to look nice. At the same time, it is one of the most durable and strongest bags available. The main material is standard calfskin, reinforced with several chains and gold-color metal. All the metal pieces are treated to perfection. For most of us, they look better than actual gold. Chains you can see share the same feature and all-new manufacturing process. Woven Chain is the main element of the bag! It is the central piece of the creation, purposely designed to make a bag special. Chevron Effect is finally here, thanks to the just mentioned chain. The bag can be paired with all sorts of clothes, without losing the stunning effect. Try and you will see.